Let’s be honest. Some days are just harder than others when dealing with family. There are days where our patience with those we love is just paper thin. It is in this time of weakness that we can say hurtful things out of emotion rather than clearly communicating how we truly feel. Jean-Jacques Rousseau is quoted saying, “A man who is a master of patience, is a master of everything else.” A man who is able to control himself when his patience is running thin, is a man that can govern his thoughts, words and actions. Just because it is hard to do, doesn’t mean that it can’t be done. 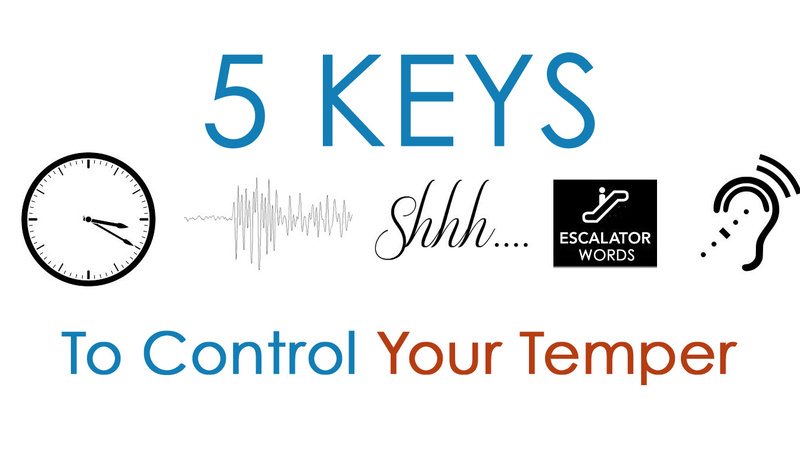 Here are 5 tips to keep your cool. 1. Give yourself a timeout. Sometimes it’s ok to give yourself a timeout in the middle of a stressful situation. Think about it. When a basketball coach calls a timeout when the other team is on a run, or has made a great play, we think of it as a great strategy to break the momentum of the other team and quiet the crowd. This allows his team to settle down, not make any further mistakes, and most importantly to be reminded of their purpose and of the game plan after the timeout. You can do the same thing! In the middle of a stressful moment, give yourself a timeout to reset and refresh so you don’t make a mistake of saying something in the moment that you may regret later. 2. Beware of the earthquake effect. I have to be honest here. There have been times when I lashed out my frustrations on my wife and kids. Not because they did anything wrong, but because I was low on patience, and they happened to be the closest people around me. Remember, those closest to you will feel the effects of when something is wrong with you. Very much like there is much more damage to buildings closest to the epicenter of an earthquake than those that are further away from it. When you feel yourself erupting, remember the possible damage that you could cause to those closest to you, and put their needs ahead of your own. 3. Don’t raise your voice. Have you ever noticed that when you raise your voice, everyone else in the conversation also raises their voice? Not raising your voice not only allows you to control your emotions during a stressful situation, it also allows you to control the intensity of the entire conversation. Proverbs 15:1 states, “A soft answer turns away wrath.” This is not saying that you are soft, or the reply is not firm. Rather, your tone is soft and controlled. Almost Presidential in character. When you control the tone of your voice, you are communicating that you are not rattled and are in total control in the situation. This attribute will make it easier for those around you to see and respect you for the leader that you are. 4. Avoid using escalator words. We’ve all done it. When our emotions are high, and in the middle of a heated argument decided to throw an insult or an issue from the past that we are still hurt about. We may be talking about who should’ve washed the dishes, but now we are bringing up something that happened years ago! Every conversation has opportunity to escalate in intensity, or not. We choose which way they go based on what we say at the time. Just because you can say something, doesn’t mean you should say something. Remember the wise words from Kenny Rogers, “know when to hold ‘em, know when to fold ‘em, know when to walk away, and know when to run.” Remember, that it is ok to punt. You don’t have to be right every time! Just punt. Let the other person think they won the point. The real winner is you for demonstrating your leadership by not allowing a situation turn into an unnecessary argument. 5. Just listen. Don’t respond at that time. Especially, if you sense that you are at a place emotionally where you feel like you are about to erupt, and you can’t give yourself a time out, or separate yourself to give you some space to calm down. This is when you should NOT focus on your frustrations and feelings at the time, rather, try to focus your energy and attention on simply listening to the person with the purpose of trying to understand where they are coming from. This is not the time to give your side of the story, or offer your input, because you still need to get your emotions under control. This is the time where you simply lean in intently and listen for the key feelings that the other person is expressing. Sometimes it’s effective to simply repeat what you hear the other person saying in an effort to make sure you understand them. This gives the person the opportunity to share whats on their heart, and feel understood. This also gives you time to gather your thoughts and emotions, and have a greater understanding of the feelings of the other person.